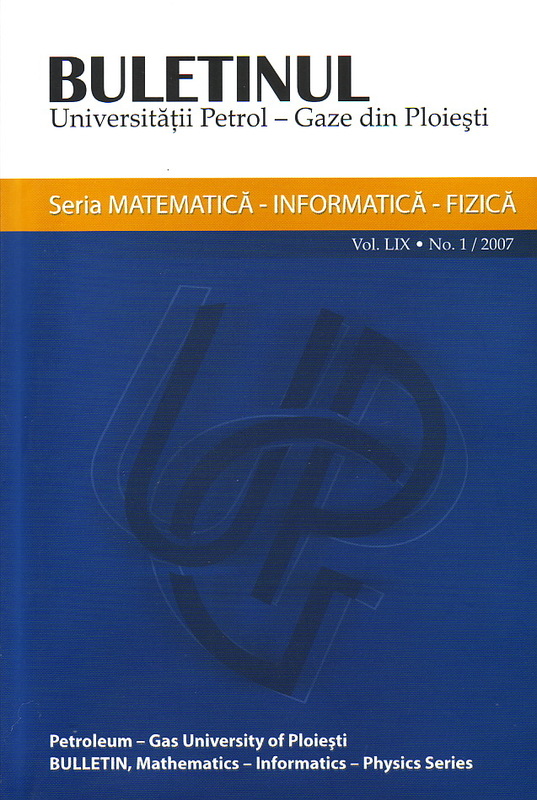 In a previous work (M. Pascu, On the definition of the Multidimensional Riemann Integral, Buletinul Universităţii Petrol-Gaze din Ploieşti, vol. LVIII, No. 2/2006, 99. 9-16) we proposed a general definition of the multidimensional generalized Riemann integral. In this paper we present two practical criteria of generalized Riemann integrability � one for the case of unbounded domain and another for the case of unbounded function. They cover the most relevant situations encountered in mathematical analysis and in the theory of partial differential equations. The theme of interpolation of a function with 2 variable values is a complex matter which raises major difficulties when solving it according to its form, the grade of interpolation of the polynomial and the number of the points from the definition field. Each problem has its own way of solving which may represent a research topic.In this paper there are presented two general cases of interpolation with polynomials of the degree n.
Collecting information and making it widely available to others has huge social implications. Hence, the Digital Library (DL) developers must act responsibly and be aware of the related legal and ethical issues. Copyright is the aspect to begin with. DL projects must be undertaken with full understanding of ownership rights and with full recognition that permissions are needed for (converting) materials that are not in the public domain. Looking at the situation from an ethical point of view helps one shed light on fundamental issues that regard intellectual property rights. Other important issues to be considered regard illegal material and cultural sensitivity. In the real world, the most optimization problems are multi-objective. For the complex ones we do not often have polynomial algorithms which return the exact solution(s) in practical time. For this reason, we use approximation algorithms which find solution(s) (near) optimal in a practical time. Alongside the aspects related to comparing two multi-objective solutions, there are also aspects related to measuring the performance of an algorithm. In the paper we present the most important performance measures for multi-objective optimization algorithms. As a practical example, we have compared three genetic algorithms on the bi-objective JSSP test-problem ft10, and the results showed the necessity to simultaneously consider many performance measures for the multi-objective algorithms. During the last years in the academic environment a special attention was placed on the knowledge management in different organizations. Universities represent an environment in which an adequate knowledge management affects their functionality in a positive way. Such management consists both of establishing the good relations between clients (students, other universities and various partners) and institution, and achieving a good knowledge of the client�s needs and processing those needs in order to solve them. In this paper an application of data mining techniques is presented so as to highlight the opportunity of using those methods in the academic environment. The Internet has encouraged a demand for online access to information. Institutions, like museums and libraries, correctly perceive that digital images � at the same time as they reduce the need for direct access to the originals � can be used to provide improved access to those works in their collections that are considered most important. Such access is location and time independent. Those who wish to implement digitization strategies must decide which objects are most suitable for digitization, to which equipment is best suited for a desired end-result. This paper presents a classification model which allows us to predict, with certain probability, an infractionality rate specific to a certain Romanian county for which we know population mean of that county, unemployment rate and average net nominal monthly salary earnings. This is made on the basis of statistic data of some counties, from all development regions of the country. Over the last years, because the increase of the electronical data was exponential, there was important to be discovered new methods to handle databases. In this paper I have tried to note down the most popular data mining techniques, their importance as well as their characteristics. The practical side consists of a system which implements one of the most well-known algorithms: ID3. Using values of variables about weather conditions, it generates a decision tree which can be used in weather forecasts. The way this algorithm was built and the experimental results are explained here. This paper includes a development of the AP: The Anthropic Principle with active observer. In order to introduce a generalization of Mach Principle and a relaxation of the Causality Principle involved we assume the existence of intelligent beings in the Universe. This paper includes a brief history of Anthropic Principle (AP) basic concepts and formulations. After the Large Number Hypothesis, presentation in Dirac � Eddington�s formulation, are discussed some forms of Anthropic Principle (AP): AP in non-restrictive form (weak AP), AP in restrictive form (strong AP), AP and the multi-world interpretation given by Everett. Also here there are presented the analysis and proposals made by other scientists, Joe Rosen and Giancarlo Cavalleri. The Petroleum � Gas University of Ploieşti Bulletin website is an online resource for all 6 series of the Bulletin. The visitors may read about identification and contact data, respectively the table of contents of all the bulletins, also having access to papers abstracts in English / French and Romanian. The abstract access is free, while the full articles are available only after authentication. The website also provides a system for the online reviewing process.